When browsing the internet, you will find many people who claim that under construction or maintenance pages are irrelevant. Those same individuals may argue that the idea of such pages is archaic and that you just can’t benefit from having one on modern websites. We had those experiences, but the truth is far from that! If you ask us, all of the things mentioned on the list are vital parts of your site and the future of your brand. So, instead of letting people see error messages while you’re doing maintenance, instead of leading people to an empty site which it’s still in the development process, you just need to take ten minutes of your precious time to create a personalized under construction page. 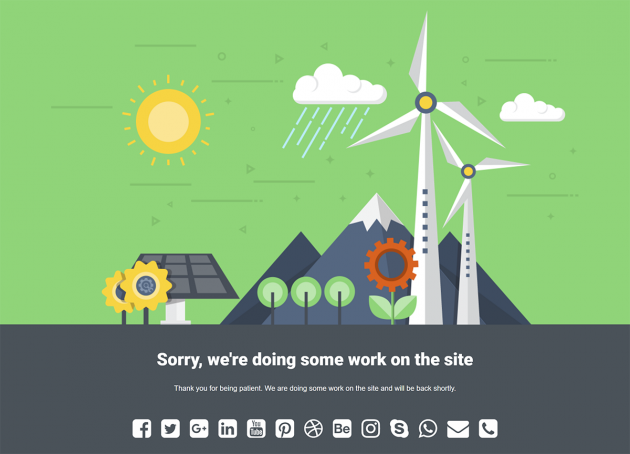 Working with WordPress has many perks, and here’s an extra one – there’s an entirely free Under Construction Page plugin that will help you develop a comprehensive maintenance page for your blog. Let us show you what this plugin can do for you. Under Construction Page is beginner-friendly, so creating a page requires just a few clicks and selections. 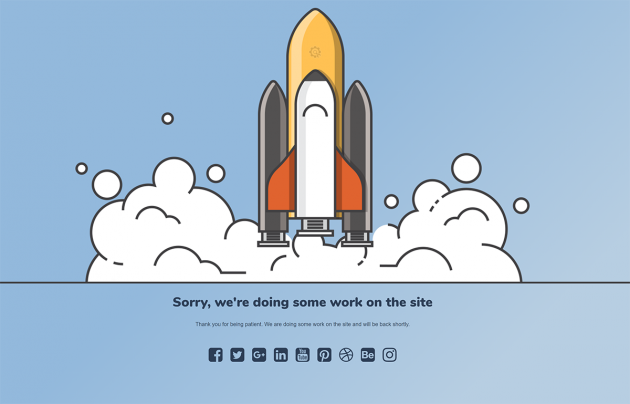 There are dozens of beautifully crafted images that will serve you as your new under construction page. You won’t have to deal with the code or mess around with different design elements. Just by choosing an image you like, your entire maintenance page will be ready for the public. The developer keeps updating the plugin on a regular basis. There’s a new version of Under Construction Page coming out every fourteen days. With a new version, besides bug fixes and improvements, each time you get a new template. So don’t forget to update the plugin and enjoy the new styles. For those who have a bit more experience with WordPress, there’s a custom CSS area where you get to personalize the entire layout. Change colors, fonts, margins or even use custom images if you want to. You will have to know some basic CSS to achieve the result you imagine, but if you’re sensitive to page design, and you just have to match the colors, this will be your new playground. After having the design you like, you will want to add some content. Here comes the great part of Under Construction Page – everything you do is SEO-friendly. So, feel free to write your custom titles, descriptions and headlines. Write more about yourself, your site or product that you’re promoting. At the moment, you’re not able to use 3rd party shortcodes in the editor. But the developer is currently working on new features, one of which is the ability to use any shortcodes you like! Don’t forget to warn people that this is just a maintenance page and let them know when they can expect your site to go online. Since you get to work with standard WordPress editors, feel free to embed images, videos and style text just like any post or page you’ve been working with. Being under construction doesn’t mean that you have to be cut off from your visitors. Just by entering your social media accounts, telephone numbers, and emails, you can allow people to get in touch with you. So, even without having your site operational, you get to talk to people. Every marketer will know the importance of this feature, so use it to make the best out of your site. Most of the time, when you’re hiding your website behind an under construction page, you will want specific users to see the regular site. For example, if you’re still working on the design or fixing a bug that caused layout glitches, you will need to see the site in order to know if the applied fix worked. Instead of going in and out of the maintenance mode, you can simply whitelist particular user roles or users. After completing the customization, you will need to press one button to enter the maintenance mode. 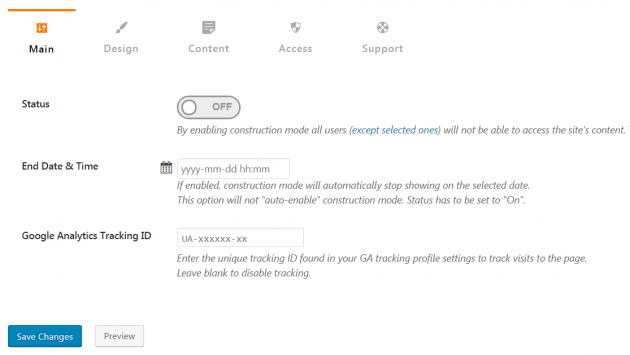 Whether you click the button from the main tab in settings or use the option in the admin bar, your under construction page will go online. The same goes for shutting down the maintenance page. This free plugin also allows you to track the page views with Google Analytics, and it’s good to know that you can set an end date and thus let the plugin publish your website when time is right. What’s your view on under construction pages? Have you ever used one? How do you like Under Construction Page plugin? Ivan Jurisic has been working with WordPress for years and he loves to write about everything related to the platform. He's been a regular author at WP Loop and works as a digital marketer at Web Factory LTD". How is that plugin free? $69 for a single site!